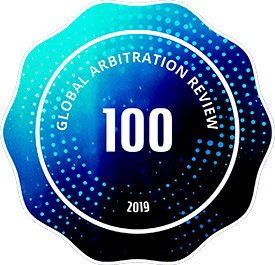 For the second year running, Global Arbitration Review (GAR) has included our international arbitration practice in GAR 100, the guide to the top 100 specialist arbitration firms worldwide. GAR’s extensive annual survey points readers to dependable counsel, offering qualitative and quantitative analysis of the leading arbitration practices around the world. Nishimura & Asahi remains Japan’s first-ever and only GAR entrant, affirming our practice’s premier position in Japan's international arbitration market as well as our status as a major Asian arbitration firm. Our international arbitration group is led by practice head Hiroyuki Tezuka, and includes partners Akihiro Hironaka, Yutaro Kawabata, Shintaro Uno and Chie Nakahara. The group also includes foreign disputes specialists Lars Markert from Germany and Natalie Yap an English lawyer previously practicing in Singapore, as well as 19 associates.